Hardman Signs has been producing Atlanta commercial signs since 1987. Our years as Atlanta commercial signage experts and our varied experiences have prepared us to meet requests from corporate signs production and corporation signage fabrication/executive signs to high-volume promotional banner printing and high-quality neon signage fabrication. Atlanta Business Signs: Expertly promote your company with our business signs. Atlanta Church Signs: We custom-create signage for Austin's churches. Atlanta Dealership Signs: Trust our company for efficient and cost-effective dealership signage. Atlanta Gas Station Signs: We design and fabricate gas station signage and perform gas station conversion services. Atlanta Hospital Signs: Contact Hardman Signs for hospital wayfinding signage, monument signage and more. Atlanta Hotel Signs: We design and fabricate signage of all types for Atlanta's hotels. 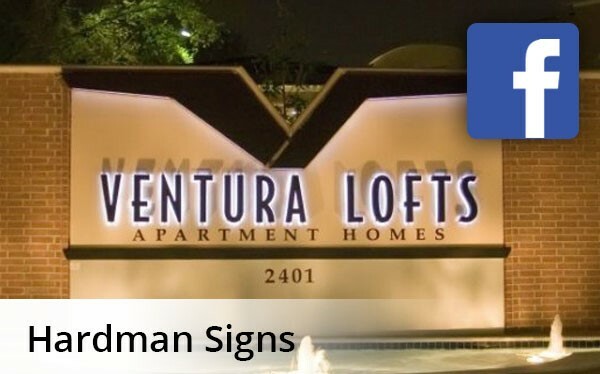 Atlanta Residential Signs: Mark your home's entry with custom-created residential signage. Atlanta Restaurant Signs: We'll create the signage that you need to make your restaurant iconic. Atlanta Retail Signs: Our company custom-creates Atlanta retail signage. Atlanta School Signs: Need interior or exterior school signage? Give our company a call. Atlanta Sports Stadium Signage: Count on us for high-quapty sports stadium signage fabrication services. Our Atlanta commercial signs company looks forward to meeting your requirements. To learn more, fill out our no-obligation quote form or call us today with your specifications.